Earlier this month in my post “Advertising on Social Media” I explored some thoughts on how effective advertising on social media sites such as Facebook is for small non-profits. My main point was that social media sharing sites are places where we go to “find out stuff” about friends, relatives, colleagues and each other. 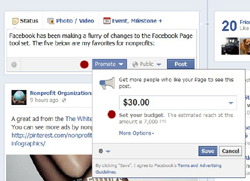 Heather Mansfield in her recent blog post Promoted Facebook Posts for Non-profits: The ROI of $30 spent in advertising shows us how she measured the difference in reach between a Facebook status update that received $30 of ads vs. a status update post that received no special promotion at all. The bottom line seems to be a 4% increase on exposure on one post for the $30 spent compared to a control post that received no special attention or promotion. The author feels that $3 would be a better price for this kind of online exposure than $30 and for small low budget non-profits advertising on Facebook is somewhat useless. The question I ask is how does this really compare with other online ads such as Google or using other online sites such as Craigslist? If a traditional local community newspaper ad increased awareness of your organization by 4% would that be considered to be worthwhile? How about niche non-profit arts organizations that promote the study of classical, jazz and world musics? If we assume 100% of the population is interested in what we are doing, then 4% seems low. But what percentage of the population is interested in our mission in the first place? If I spend $150 on a display ad in a local paper, it may reach 50,000 readers. But of those readers, what percentage might actually be interested? Of that small percentage of people interested , what percentage is actually going to act on the information in the ad? I suspect that the number is much, much less than 4%. So is this another case of “we see what we look for” and our perceptions are being skewed by preconceived biases that we have before we even start?